The bridge is called “King Hussein” by Jordan and “Allenby” by Israel. King Hussein of Jordan (Lion of Jordan) was from the Hashemite family who claim direct descent from the Prophet Mohammad. Hussein's rule extended through the Cold War and four decades of Arab-Israeli conflict. He recognized Israel in 1994, becoming the second Arab head of state to do so (after Anwar Sadat in 1978/1979). Edmund Allenby was one of Britain’s most successful commanders during WWI. He captured Jerusalem from the Ottoman Turks. When he entered the Holy City, he ordered his soldiers to dismount as a mark of respect to the City of God. The Allenby Bridge is the primary land-crossing point between Israel and Jordan. It was first built in 1885 by the Ottomans, rebuilt in 1918, destroyed in 1946 (Operation Markolet/Night of the Bridges), destroyed in 1967 six-day war and rebuilt again in 1968. Finally a modern bridge was built adjacent to the wood bridge in the 1990s with the aid of the Japanese Government. Currently, the KHB is the only international border crossing in the West Bank. It is also the designated exit/entry point for Palestinians residing in the West Bank, and for those travelling to and from Jordan. 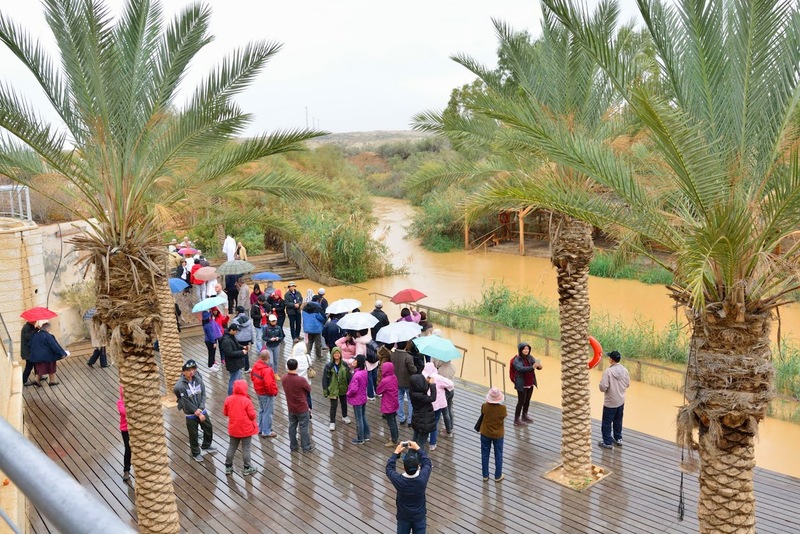 The Bridge is located 5km east of Jericho City, and spans the ancient River Jordan. It serves West Bank businesses that import and export to and from Jordan and the greater Middle East region. As of now, the Palestinian side of the border is controlled exclusively by the Israeli Airport Authority. Thank God for a smooth immigration and our Israel guide, Michael, was surprised we cleared the immigration so fast. 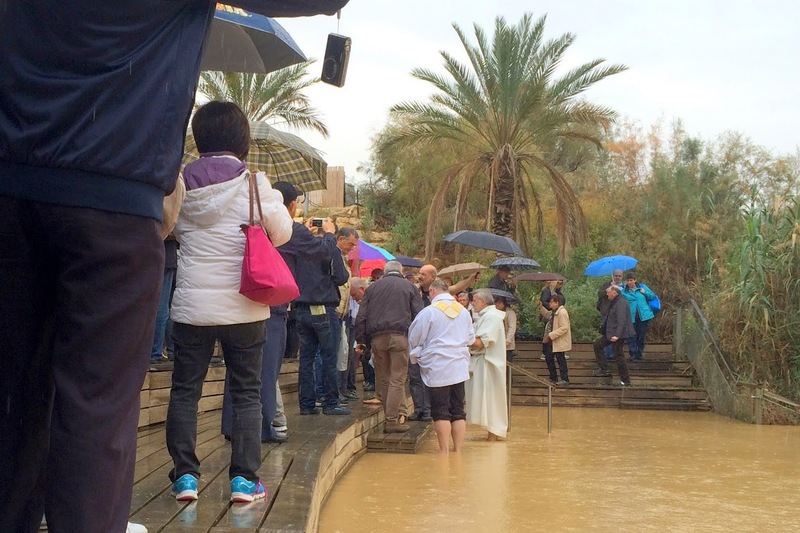 First stop after entering Israel was to visit the baptismal site at River Jordan where John the Baptist was believed to have baptised the Lord Jesus. This site was very near to the Immigration Area. 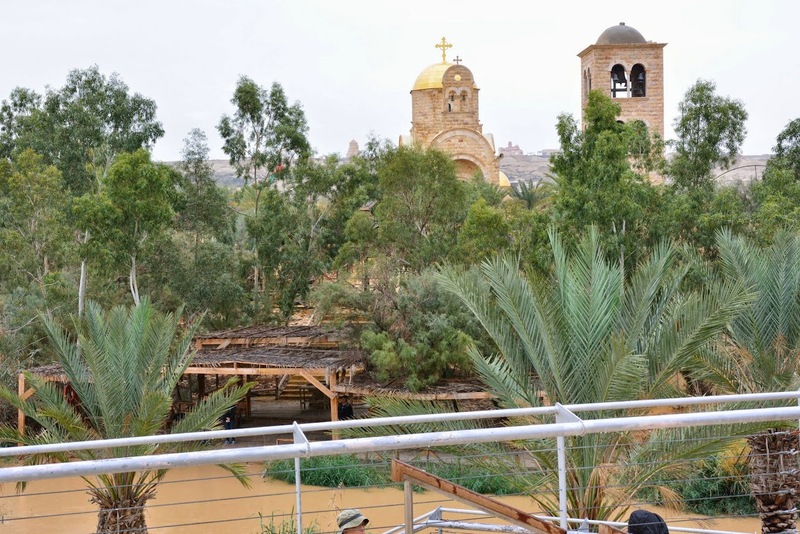 The Jordan River has changed course over the centuries and the precise spot where John baptised Jesus will probably never be positively identified. 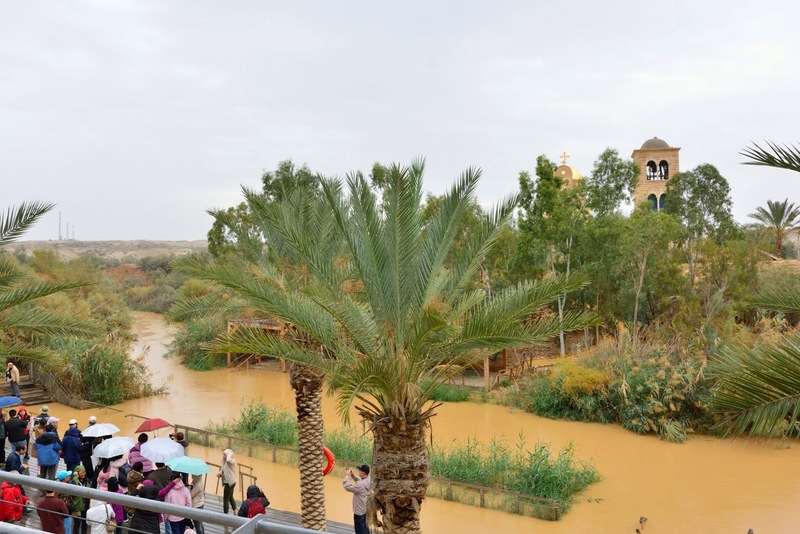 The baptism of Jesus by John the Baptist, the act that launched Jesus’ public ministry, most likely took place on the Jordanian side of the Jordan River, in a perennial riverbed called the Wadi Al-Kharrar. Here the remains of more than 20 Christian sites have been discovered, including several churches, a prayer hall, baptismal pools and a sophisticated water reticulation system. These date back to the Roman and Byzantine periods. Excavations at Bethany Beyond the Jordan began only in 1996. Before then the area had been a minefield on the front line between Jordan and Israel, whose border is the Jordan River. 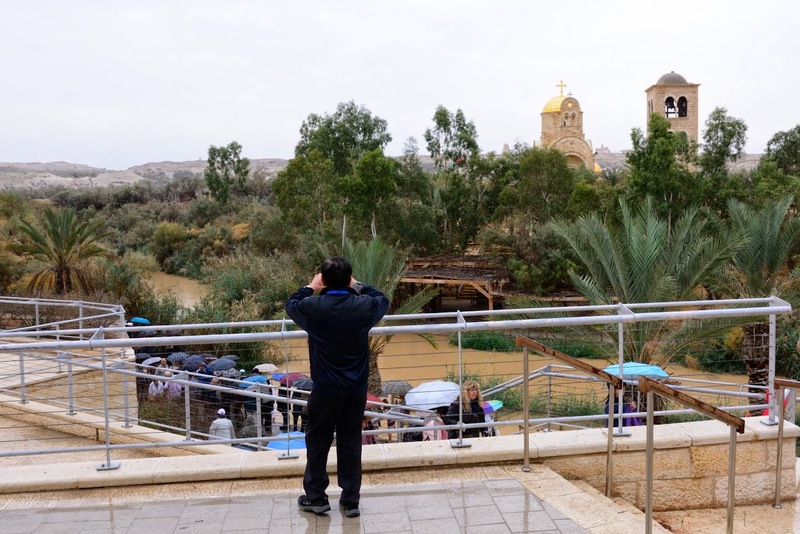 It should not be confused with the Bethany on the eastern slope of the Mount of Olives, near Jerusalem, where Jesus raised Lazarus from the dead. Elijah — whom John the Baptism is often compared with — crossed the Jordan River on dry ground in this area, and was then taken up to heaven in a chariot of fire (2 Kings 2:8-11). In the New Testament, Jesus withdrew to Bethany Beyond the Jordan after being threatened with stoning in Jerusalem (John 10:31-40). The Israelites built a nice park and chapel near the river, very modern and clean. It was drizzling though. Lots of shower of blessings for the chosen people. 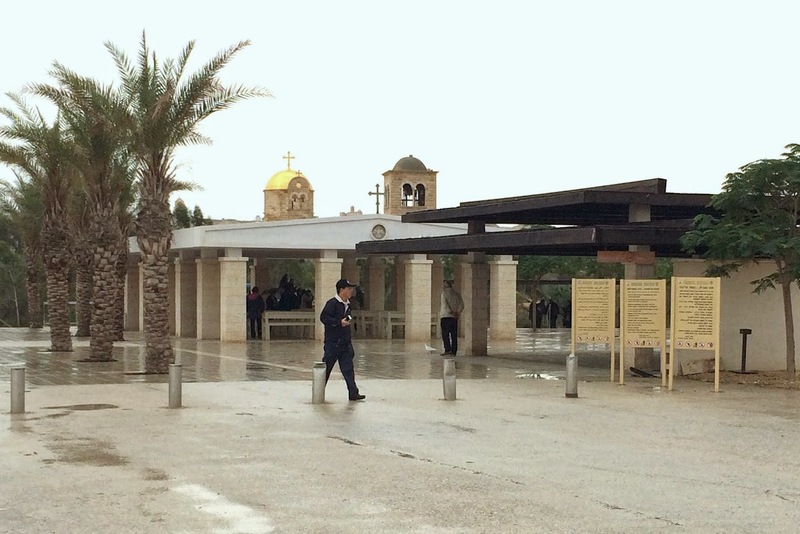 A vast difference between the park at Israel and Jordan. See for yourself. 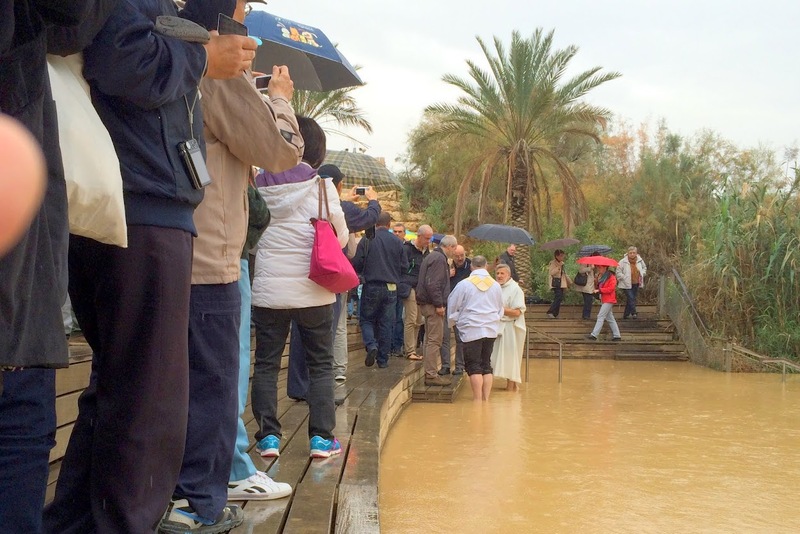 Some people were being baptised at murky River Jordan. The water level had reclined over the decades. In Jesus' time, it was about 2 stories high.